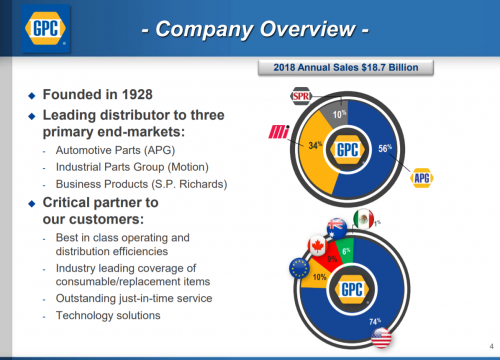 Genuine Parts Company (GPC) has been a favorite of dividend investors for decades. The reason is because the company is a Dividend King, meaning it has at least 50 consecutive years of dividend increases. This is a very exclusive group of stocks that many consider to be the best of the best when it comes to returning cash to shareholders. We like Genuine Parts for its predictable dividend growth, its meaningful yield, and its prospects for growth. A recent rally in the share price has us more cautious on the valuation, but the stock is still among the auto parts retailers. Genuine Part is the only auto parts retailer stock that pays a meaningful dividend. For that reason, income investors may still find it attractive, with a nearly 3% dividend yield. Genuine Parts was founded in 1928 and in the 90+ years since, has grown into a $15 billion market capitalization on more than $19 billion in annual revenue. The company is made up of three major segments: Automotive Parts, Industrial Parts, and Business Products. The largest segment, by far, is the auto parts segment where its Napa brand is the key contributor, and likely the brand investors know best of the three. The industrial segment provides industrial replacement parts to over 300,000 customers of all shapes and sizes. The business products segment provides office supplies to a wide customer base, and is Genuine Parts’ smallest segment. Genuine Parts reported Q4 earnings on 2/19/19 and the company produced robust revenue and earnings growth. The top line rose 9% thanks to a 4.6% gain in comparable sales and a 6% gain from acquisitions. This was partially offset by a 1.2% currency headwind, but the company’s Q4 revenue looked very strong overall. The automotive business led the way with a revenue gain of 11% in Q4, followed by a 9% rise for the industrial segment, and a modest 1.6% increase from the business products business. Gross margins were up a very impressive 300bps in Q4 to 33.5% of revenue. Operating margins rose just 30bps to 7.7% of revenue, however, as SG&A costs rose. This is due to Genuine Parts’ acquisition-heavy strategy, which causes SG&A costs to temporarily spike while acquisitions are being integrated. We do not believe the company’s operating margins are being impaired for the long-term. Adjusted earnings-per-share rose 13% in Q4 and 21% for the full year 2018, reflecting growth in revenue and margins. Last year was a record for the top and bottom lines, and we believe new records are coming this year once again. Our initial estimate is for earnings-per-share of $5.88, which is the midpoint of guidance provided by management during the Q4 earnings release. 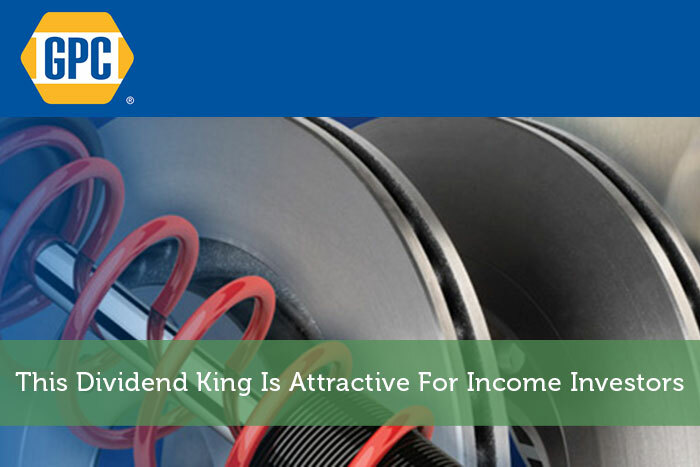 The company’s dividend is obviously paramount to investors and Genuine Parts recently came through with yet another increase in the payout, this time raising it 6% to $3.05 annually. Genuine Parts has an impressive track record of growth over decades, which is how it has been able to continuously increase its dividend throughout a variety of economic conditions. The company has managed to set earnings-per-share records in eight of the past ten years, setting records for sales in seven of those years as well. The company’s outright growth rates haven’t been huge by any means for many of those years, but Genuine Parts’ willingness to go after growth via acquisitions has served it well over time. We see 6% total earnings-per-share growth annually in the coming years from a combination of revenue growth, margin expansion, and a lower share count. The company’s comparable sales have risen nicely in recent quarters and while no large acquisitions are in the pipeline as of now, the company is constantly on the hunt for its next leg of growth. Combined, we see these two sources of revenue as providing at least a mid-single digit top line growth rate in the coming years. Margins should rise as well as the company’s gross margins have improved drastically of late, and while the low-hanging fruit has been picked, we believe the company’s sourcing and cost-saving efforts will continue to pay off. Finally, we see a low single digit tailwind from a lower share count. Genuine Parts will buy back stock when it can, which varies depending upon if it is integrating a large acquisition or not. We don’t see this as a primary driver of earnings-per-share growth, but it should help a bit. Finally, we see Genuine Parts’ robust free cash flow generation as a key consideration for the growth prospects of the company. Not only does it afford the company the ability to pay and raise the dividend over time, but it allows Genuine Parts to spend on investing for the future and finance future acquisitions. Indeed, the dividend should cost about $440 million this year, while capital expenditures continue to ramp higher, reaching $300 million in 2019. That still leaves more than $400 million that is available for Genuine Parts to acquire growth, pay down debt, or buy back stock. In total, we see Genuine Parts as producing ~7% annual total returns in the years to come. A significant portion of that return will come from the 2.8% yield, while we also see 6% accruing from earnings growth. With the stock priced at $107, we see it as slightly in excess of our fair value estimate at $100, implying a low single digit headwind as the valuation moderates slightly over time. Still, given the relative overvaluation of the company’s competitors, and the fact that it offers a strong yield and unparalleled dividend history, Genuine Parts looks like a good pick today for income. With a high single-digit total return forecast and one of the best dividend histories of any stock in the US market, we still like Genuine Parts despite the slight overvaluation. We’d recommend investors wait for a price closer to $100 – or preferably below that – but overall, the company’s yield and Dividend King status make it attractive in our view. Because of the price, we have the stock at a hold recommendation, but on a fundamental and yield basis, Genuine Parts is hard to beat.